Piaggio's unique MP3 scooter, with its two wheels in front and one in back, has been turning heads since its introduction as a 250cc model a few years ago. After getting the chance to ride the latest 400cc and 500cc versions, we can confirm that it still causes its fair share of rubber-neckers. As automotive drivers, we wondered if Piaggio's entry into the growing maxi-scooter segment could be a viable car alternative for some consumers, and as motorcycle riders, we wondered how those two-front wheels would feel as we chucked it into some bendy-roads. We found all we wanted to know and more after two days worth of driving through both downtown New York City and the surrounding rural roadways all the way into Connecticut. We'll get to the riding impressions in a bit; first let's take a walkaround. One major aspect to consider when deciding how practical a scooter will be is storage. The overall usefulness of the vehicle can be greatly impacted if there is not enough room for your objects. Consider, too, if there is a specific place to keep a helmet when you dismount the machine. In the case of the Piaggio MP3, the 400 and 500 versions offer differing takes on the storage conundrum. The 400 would be the obvious choice if you don't want to add any extra cases to your mount, as its under-seat space is ample for most helmets. If more room is needed, topcases are available for both the 400 and 500 models. The 250, which is the original model from Piaggio, offers just as much room as the 400, so keep that in mind when shopping. How about wind protection? Both models come from Italy with a full front legshield and a small wind deflector. This proves adequate for around-town riding, but expect to feel a bit wind-blown at high speeds. Two optional windscreens were fitted to our test models, one of which looks much like the alien-head from the classic movie franchise. Though odd looking, the touring screen proved the most adept at creating a bubble in which to ride. That large screen also did wonders when we encountered a small patch of rain. The smaller optional screen also did a fine job of deflecting the wind, bugs and road debris that makes hard contact with your person when riding on the highways without a screen. A full-face helmet would be a wise addition if you plan to ride sans-screen. 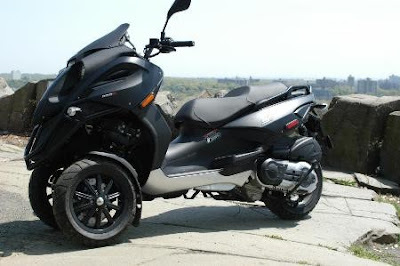 Piaggio has seen fit to offer two distinct looks for the MP3. The orignal 250's appearance is carried-over to the new 400 model, which the mad-max style from the Euro-only Gilera 500 comes over intact on the 500. We favored the 500's appearance, to be honest, and we also preferred its onboard computer to the 400's. The 500 also offers more options when it comes to the good ole bungee, as its exposed metal frame features plenty of places to attach to. We detected a bit more mirror-shake from the 500, though both models were fairly decent for their 360-degree view. We preferred the instruments from the 500 as well. Either model garners plenty of attention from passers-by, so those who don't like attention might want to look elsewhere. It's the ride that proved the most enlightening feature of the MP3. We got the chance to hop on the original 250 for a brief spin... to be honest, it proved plenty powerful, even on the highway. The 500cc engine offers noticeably more grunt than the 400, so if passing power is your priority, the choice is pretty easy. The 400 proved to be a tweener model in our eyes, as the 250 offers just as much practicality along with a bit more fuel efficiency. The 500 gets around 60 mpg. This section could be titled, "How I learned to stop worrying and trust the front-end." Those riders used to a single contact patch in the front may find some trepidation when it comes to leaning the MP3 deep into a corner. We found that there is no need to worry, as the deep scrapes from the center stand will attest to. Contact with the pavement from hard-parts proved extremely easy, though there is plenty of lean-angle. Another benefit to the dual front wheels appears when braking. We had no trouble at all locking up the rear brake, but it's the front set that delivers the real stopping power. 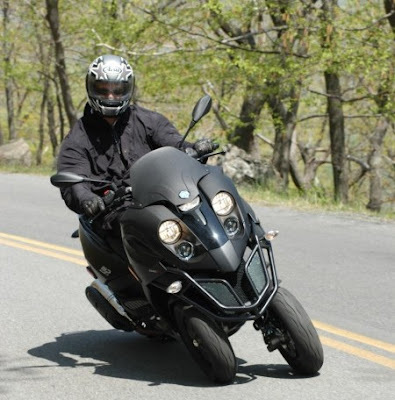 As with most two-wheelers, braking through corners makes the MP3 want to "stand up," so set your pace before the entry point and power out the other end. We had a great deal of fun with this approach, and the MP3 does nothing but inspire confidence. When rolling to a stop, a button press on the right handgrip allows the MP3 to lock into an upright position. In the end, the pick of the litter would have to be the 500. Though it offers slightly less storage, it makes up for this shortcoming with adequate power and great looks. We'd recommend adding a topcase to the rear and would also consider an optional windshield for touring use, though a full-face helmet would likely be enough for most circumstances. We can think of no better scooters for around town errand running, for the commute to work or for past riders looking to rejoin the world of two-wheelers (ok, three-wheelers). Nobody missed the MP3s on the roadways, as their size and unique presence makes them highly visible. As with all scooters and motorcycles, though, be sure to get the proper training and always gear-up with a good helmet and riding apparel. When ridden properly and under the right circumstances, the Piaggio MP3 seems to offer a compelling alternative to the maxi-scooter norm and even midsize motorcycles. The PIAGGIO MP3 500 uses innovative technology and premium cycle components to re-invent the very concept of the scooter. With two front wheels and one at the rear, the PIAGGIO MP3 500 is sure to turn heads wherever it goes; its dynamic design offers unparalleled stability to provide an unprecedented riding experience. 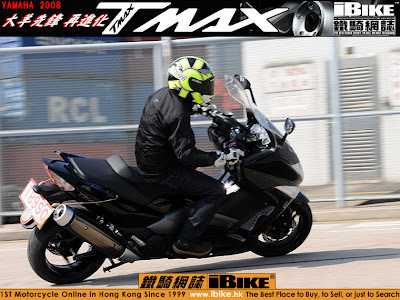 The MP3 500 ie, which shares the same technological platform as the revolutionary original MP3, delivers show-stopping looks, incredible performance and the X factor that makes it stand out from other anonymous maxi scooters. The machine is particularly in its element on twisty roads, where the razor-sharp handling is complemented by a superb three-disc braking system and the double ignition “Master” engine. With a strong personality, aggressive design and cutting-edge technology, the MP3 500ie is ready to ride into uncharted territory, see specs below! 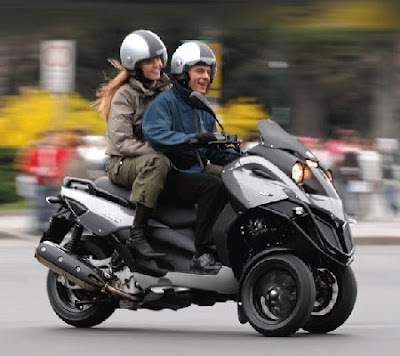 Go out on the Piaggio MP3 500 and enter a completely new dimension: of sensations and safety. 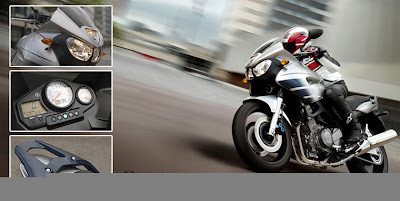 The two front wheels combine the ride dynamics typical of a motorcycle with incredible road holding. The parallelogram suspension system, a Piaggio patented innovation, guarantees unrivalled stability, even on wet or loose tarmac, or trailing other vehicles. The Piaggio MP3 500 is also distinguished by exceptional braking performance: thanks to the 3 wheels and 2 powerful 240mm disc brakes with twin piston calipers in front and a 280mm disc in rear, allowing record deceleration (around 8 meters per second) and a stopping distance more than 20% shorter than that of normal two-wheeled scooters (even with ABS). Designed using the most sophisticated CAD programs and rigorously tested at each stage of its development, the Piaggio MP3 500 scooter is cutting edge in all of its details. The high-strength tubular steel frame guarantees the best stability and distribution of weight, in perfect harmony with the engine and suspensions. The dimensions and proportions are similar to those of a traditional scooter, with even a small front end. Developed in the wind tunnel, the bodywork combines a revolutionary look with dual functions: maximum protection for the rider at the front, comfort and exceptional storage capacity at the back. Piaggio MP3 500 is extraordinary in every way, including its accessories; from the “winter pack” with the comfort windshield, the special winter tires, the heated leg cover and waistcoat, to the Tom Tom Rider GPS navigator with its 3.5” LCD monitor, the X-Jet helmet complete with a Bluetooth communication system, the electronic anti-theft device with remote and other great ideas. Actually, they are revolutionary: just like your Piaggio MP3.